During my recent visit to Borobudur I tried to identify as many scenes in the first gallery of the great temple as I could. The 120 carved panels in this gallery supposedly illustrate the Lalitavistara, an early and extremely ornate biography of the Buddha (perhaps 2nd cent. BCE to 1st cent. CE). But identifying the events the panels supposedly depict is no easy task. During my last two visits to Borobudur I identified some of the scenes but other, most of them in fact, completely eluded me. However, one I was able to make out and which I missed last time, is the charming story of the Buddha and the ferryman. The story, now famous because Herman Hess included it in his Siddhartha, has the Buddha arriving at a river while on his way from Uruvela to Isipatana. The ferryman refuses to take him across because he does not have money to pay for the trip. To the ferryman’s utter amazement the Buddha disappears and then re-appears on the further bank. The story finishes by saying that when the Buddha related this incident to King Bimbisara he, the king, issued an edict allowing all ascetics in Magadha to travel by ferries for free. Although my picture of this panel is not very clear, it shows the nonplussed ferryman on the right, the ferry with its paddle-like rudder and canopy, the forest with its creatures through which the river is flowing, and on the right, the Buddha on the far bank. There is even a few fish and a tortoise in the river. This story might be an elaboration of a similar miraculous crossing of a river from Digha Nikaya II,89. More likely, it was probably thought up to explain the tradition in ancient India of allowing Buddhist monks and other ascetics to travel for free on public transport. It appears that this story is quite old, but never made it into the Pali Canon. It is found in Mahāvastu, see here at the bottom of the page, where the telling is quite primitive in form. 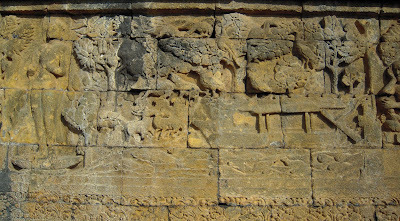 A clearer photograph of the scene at Borobudur can be seen here. Thank you for the story of Shi Lansong, such a kind and selfless person. What a great spirit he has. This is indeed a wonderful post. The ferryman must have regretted for life. And oh yes, you may like to see this.